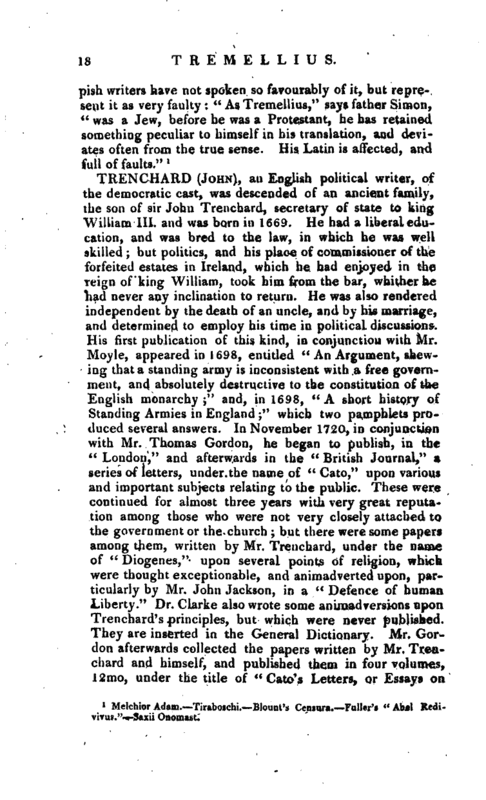 , an English political writer, of the democratic cast, was descended of an ancient family, the son of sir John Trenchard, secretary of state to king William III. and was born in 1669. 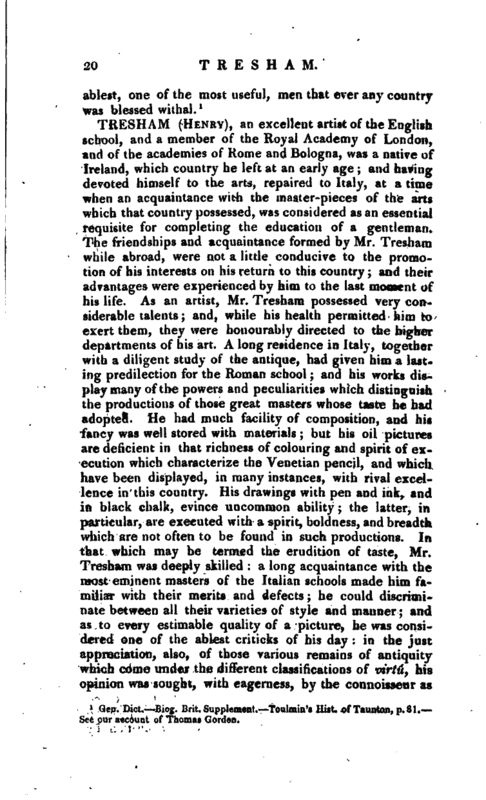 “”He had a liberal education, and was bred to the law, in which he was well skilled; but politics, and his place of commissioner of the forfeited estates in Ireland, which he had enjoyed in the reign of king William, took him from the bar, whither he had never any inclination to return. He was also rendered independent by the death of an uncle, and by his marriage, and determined to employ his time in political discussions. His first publication of this kind, in conjunction with Mr. Moyle, appeared in 1698, entitled “An Argument, shewing that a standing army is inconsistent with a free government, and absolutely destructive to the constitution of the English monarchy;” and, in 1698, “A short history of Standing Armies in England;” which two pamphlets produced several answers. 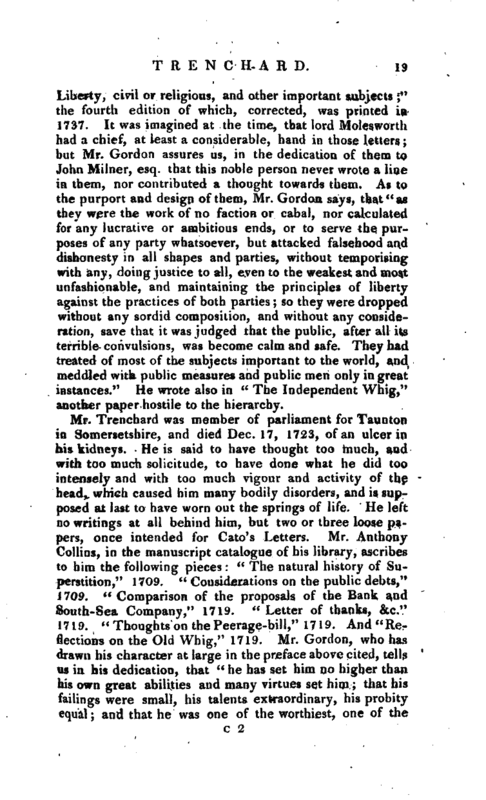 In November 1720, in conjunction with Mr. Thomas Gordon, he began to publish, in the “London,‘ 7 and afterwards in the” British Journal,“a series of letters, under the name of” Cato,“upon various and important subjects relating to the public. These were continued for almost three years with very great reputation among those who were not very closely attached to the government or the church; but there were some papers among them, written by Mr. Trenchard, under the name of” Diogenes,“upon several points of religion, which were thought exceptionable, and animadverted upon, particularly by Mr. John Jackson, in a” Defence of human Liberty.“Dr. Clarke also wrote some animadversions upon Trenchard’s principles, but which were never published. They are inserted in the General Dictionary. Mr. Gordon afterwards collected the papers written by Mr. Trenchard and himself, and published them in four volumes, 12mo, under the title of” Cato’s Letters, or Essays on | Liberty, civil or religions, and other important subjects;“the fourth edition of which, corrected, was printed in 1737. It was imagined at the time, that lord Molesworth had a chief, at least a considerable, hand in those letters; but Mr. Gordon assures us, in the dedication of them to John Milner, esq. that this noble person never wrote a line in them, nor contributed a thought towards them. As to the purport and design of them, Mr. Gordon says, that” as they were the work of no faction or cabal, nor calculated for any lucrative or ambitious ends, or to serve the purposes of any party whatsoever, but attacked falsehood and dishonesty in all shapes and parties, without temporising with any, doing justice to all, even to the weakest and most unfashionable, and maintaining the principles of liberty against the practices of boih parties; so they were dropped without any sordid composition, and without any consideration, save that it was judged that the public, after all its terrible convulsions, was become calm and safe. They had treated of most of the subjects important to the world, and meddled with public measures and public men only in great instances.“He wrote also in” The Independent Whig," another paper hostile to ’the hierarchy.